Tooth-coloured Fillings enable you to maintain your beautiful white smile even if you require dental work. 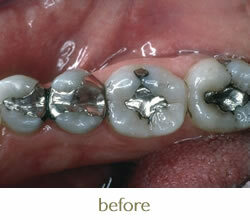 No longer is it necessary for unsightly Amalgam (mercury) Fillings to be used in dental treatments. Our practice ONLY uses uses tooth coloured filling material, which are virtually invisible, making your teeth appear whiter, brighter and healthier than before. It is now possible to have Tooth-coloured Fillings created to match the exact colour, texture and translucency of your existing teeth. Tooth-coloured Fillings offer the same strength as natural tooth enamel and do not stain teeth. They limit further tooth decay, as the surface of Tooth-coloured Fillings is very smooth and therefore does not adhere to any food particles. 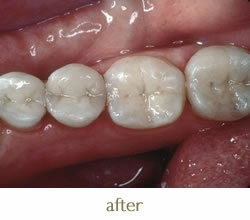 Tooth-coloured Fillings are not only limited to new dental repairs, older fillings may also be replaced. These aesthetic materials will help give your smile a new lease on life!